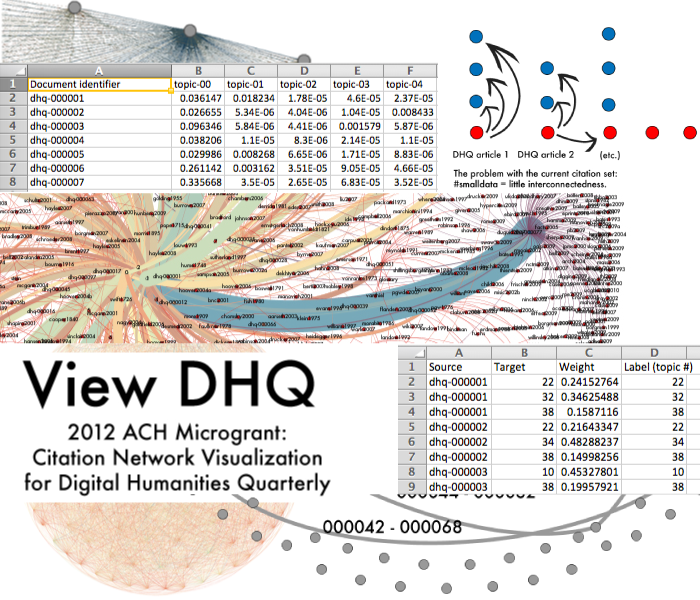 Digital humanities design for a more open humanities. I envision, prototype, & analyze digital learning interfaces & their user communities, grounded on a strong research background (PhD, MS) and nearly 10 years of professional DH web design & development. Download my resume. Currently: Managing Director of the Scholars' Lab digital humanities center at the University of Virginia Library. Challenge: Pull the right "sound" for each reader out of the "noise" of a socially annotated text. 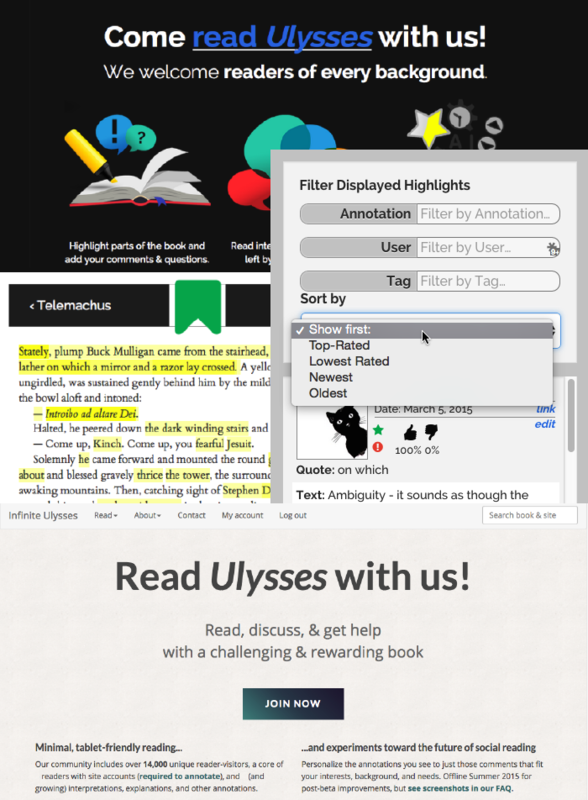 How I met the challenge: Designed InfiniteUlysses.com, a digital platform for collaborative annotation of James Joyce's challenging novel. 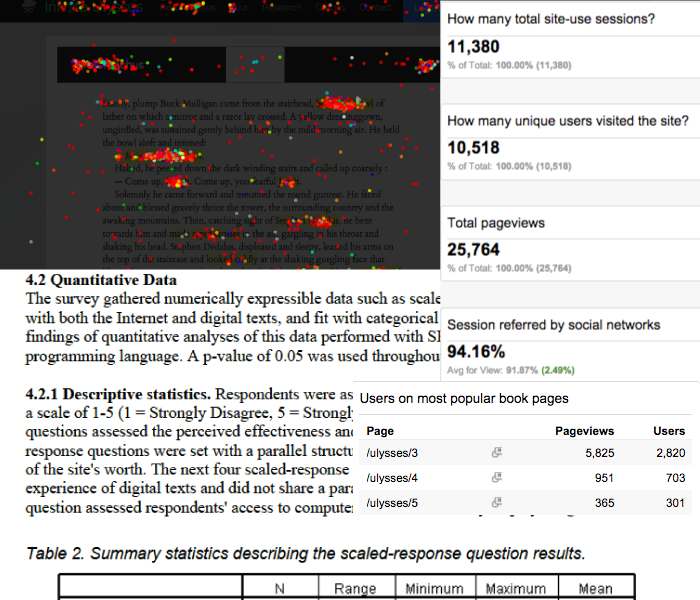 Personalized which annotations on the book were shown to any individual reader through features successful on sites like Reddit and StackExchange: voting, tagging, filtering, sorting, and favoriting, with user-testing and site analytics analysis supporting these methods of customization. Infinite Ulysses was cited in The New York Times Sunday Book Review, made it into the daily top 20 on Hacker News and had 12,000+ visitors just during the first few weeks of its open beta. 600+ readers have created site accounts and authored 900+ annotations on the text during that first month. A post-Ph.D. 1.0 release of the site is planned (see mockup screenshot at bottom of left collage image). This release will divide the site into two parts. One part wil be an broadly accessible, minimal "reading" text to serve the many users who come to the site interested in reading, not annotating. The other part is a "Lab" text, where I'll continue experimentation with annotation filtering, community curation, and interface design. I successfully defended the dissertation in April 2015 and was awarded my university's Distinguished Dissertation Award for that year. The website dr.amandavisconti.com is the dissertation, collecting the various pieces of writing, design, coding, and other methods used in my research. Challenge: Make web annotation display easily customizable, adding social rating and favoriting features as proof of concept. 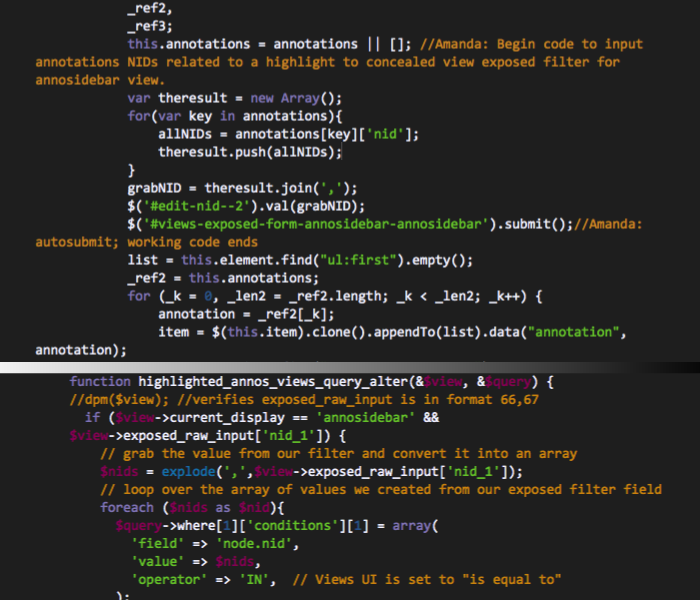 How I met the challenge: Tie the highlighting of annotated text into social voting and SQL queries by creating a Drupal module (PHP, JS) extending Annotator.js. Voting allows users to rate annotation usefulness, while access to SQL queries let readers personalize what annotations are displayed to them using a variety of filters and sorts. For example: "Don't show me spoilers, show me annotations by others first-time readers of the book; don't show me translations of Spanish since I speak it, but do prioritize annotations on my areas of interest like puns and post-colonial theory". Code and other media related to the project (e.g. wireframes, affinity mapping) are available on a public GitHub repository. Challenge: Understand how social annotation and personalization affect digital reading. How I met the challenge: Iterating InfiniteUlysses.com's look and functionality in response to ten kinds of formal and informal user testing, including participatory design sketching, paired observation, formal survey metrics, and analysis of click heatmaps. Used quantitative and qualitative audience and usability research, data from site use analytics, and data visualization to improve audience design personas. A whitepaper reports on user study and site analytics results. Challenge: Help an online cultural archive's visitors browse the collection without the arbitrary ordering of a linear index. How I met the challenge: Instead of rebuilding wheels, experimented with various existing scripts for randomized item display. 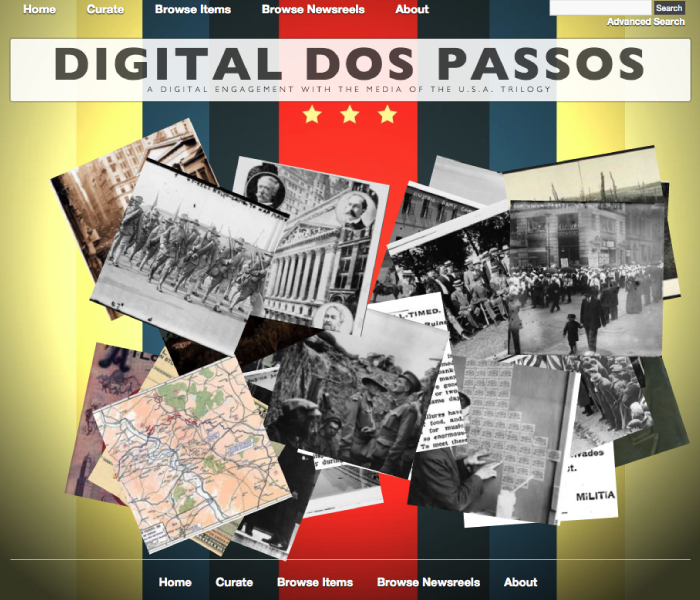 Customized design of shuffled photographic images to always present digital archive visitors with different paths into a chaotic multimedia collection. This design ensured item interaction wasn't arbitrary weighted toward items near the beginning of traditional means of sorting a collection such as alphabetical by title or chronological ordering. 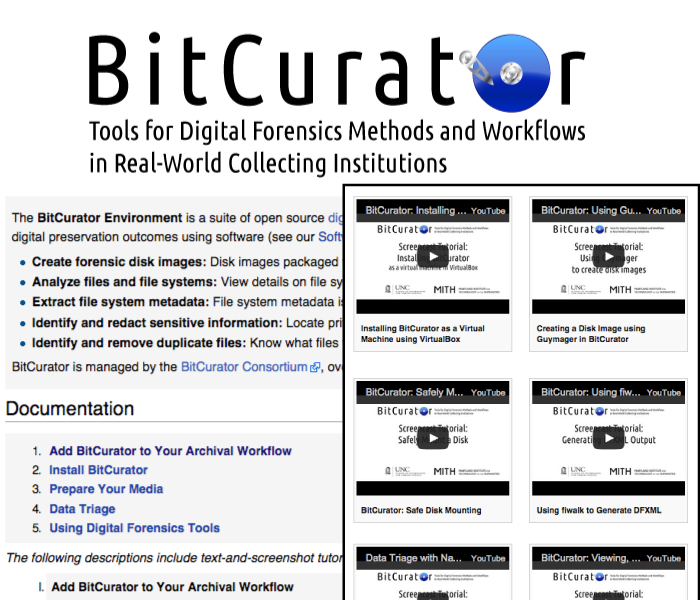 Challenge: Make digital forensics software (think CSI) accessible to digital museum curators, for use on born-digital cultural materials like a famous author's laptop. How I met the challenge: Crafted video, image, and wiki text documentation making software use understandable and inviting to non-technical users. Revamped Mediawiki site design and information architecture. Software usability testing and recommendations. Wordpress site design for research blogging. Challenge: What patterns of research collaboration and citation emerge as the field of digital humanities develops? How I met the challenge: Used Gephi to visualize citation networks in digital humanities research, including via Mallet-based topic modeling data. A website walked the interested public through the questions and design choices encountered, and I blogged novice-friendly instructions for people who'd like to try similar methods. An active member of the digital humanities community (research, teaching, and learning for fields like literature, history, and the arts), including running the Digital Humanities Slack (1900+ members; join us!) and an elected member on the executive council of the North American digital humanities scholarly organization (ACH, the Association for Computers and the Humanities). I frequently blog my work at LiteratureGeek.com (highlighted 16 times on Digital Humanities Now) and tweet with others in my field (3900+ followers) @Literature_Geek. I co-organized the first THATCamp Games unconference on digital humanities and gaming (rave reviews from attendees), and I was part of an NSF-funded team that designed and ran an educational alternate reality game (ARG) that taught students information literacy and STEM skills. Thinking and doing human-computer interaction for 10+ years. I'm trained in HCI (human-computer interaction) and information science via a master's degree from the University of Michigan School of Information, where I designed, ran, and analyzed a formal user study looking at what small design changes to scholarly archives and digital editions would open these interfaces to public audiences. Successfully argued for, designed, and defended a unique literature dissertation with zero written chapters: design, code, usertesting, and blogging around the Infinite Ulysses social reading platform accepted as the full critical work they were. Showcased strong project design and management skills: getting buy-in across my university, completing a unique project in the minimum possible time, parlaying an extremely non-traditional project into a tenure-track professorship. I blogged my design research and technical challenges twice monthly, and authored a whitepaper discussing design process and product during the month before its defense. Now authoring a hybrid print/digital/code repository handbook for others pursuing digital dissertations! Committed to universal design and accessibility; I helped develop a WordPress plugin to convert posts to Braille output as part of the Making the Digital Humanities More Open team, and I wrote a patch for the browser-grayscaling issue with the WordPress Accessibility plugin that was incorporated into the plugin with version 1.2.9. I'm now working on a model for co-evolving library archival, DH, and publishing work to be actively diverse, inclusive, and accessible. I'm also leading work on a code of conduct specific to online digital humanities spaces. Blogging what I've learned so that others can get started using Gephi for information visualization or other advice like how to do digital work as a humanities graduate student. I wrote a peer-reviewed lesson on creating your own Jekyll professional website at The Programming Historian, and I afterwards joined The Programming Historian's editorial team as an editor and ombudsperson. I'm skilled at translating technical language into public-friendly text. I like to share my works in progress on GitHub (e.g. a dataset for exploring the musical Hamilton, a maintenance theme for the Omeka digital museum CMS, and a marked-up digital text of Ulysses ready for site import in CSV and HTML formats). Invited speaking 2015-2016 included keynoting the THATCAMP Vanderbilt 2016 and invited talks for the DLF (Digital Library Federation) eResearch Network, CUNY Graduate Center, Brown University, the MIT Media Lab, the Northeastern University Center for Digital Humanities & Computational Social Science, and UCLA Institute for Pure & Applied Math. I was also an invited participant in the NEH-funded, CHNM-hosted One Week | One Tool digital humanities barn-raising that produced the Serendip-o-matic.com playful research source discovery portal, the NEH-funded, Scholars' Lab-hosted Speaking in Code symposium of advanced digital humanities developers, and MITH's CrowdCon symposium on meaningful crowdsourcing. I work across the design and making research spectrum: envisioning, building, and user-testing digital interfaces, combining strong research backgrounds in data-driven design and literary studies to innovate user experiences for social learning and reading. I'm currently the Managing Director of the Scholars' Lab digital humanities center at the University of Virginia Library, run the Digital Humanities Slack, and serve as a Programming Historian board member/technical editor and ombudsperson and as an executive council member for the ACH (the North American DH scholarly organization). M.S. in Information (Human-Computer Interaction). Web Design and Development. HTML5/CSS3, XML/TEI, interface design, actively improving PHP and JS (most solid in CMS context): I'm a co-creator of the WordPress Braille plugin, and created a Drupal module adding social features like favoriting and voting to Annotator.js. Rapid prototyping, server/VPS configuration, MySQL database management; Jekyll; CMS theming and plugin customization/creation: Drupal, Omeka, WordPress/WPMU, BuddyPress, Mediawiki. Past experience in Python and Ruby on Rails. Visual Design. Adobe Creative Suite: Illustrator, Photoshop, InDesign. Gephi information visualization. Wireframing and rapid interface prototyping. Collaboration. Git/GitHub, Asana, Basecamp, Lighthouse, Trello, SVN, Slack, Google Drive. Rich experience of team collaboration with diverse research roles, backgrounds, audiences, values. User research. Participatory design sketching. ; accessible web design and site testing; user study metric creation, deployment, and analysis for digital reading research; Google Analytics. Custom site analytics including Google Analytics; nVivo; Gephi information visualization. Past R and SPSS experience. Clear Communication with Diverse Audiences. Academic and technical writing, editing, user-friendly documentation, research blogging, teaching/training. Expert written and spoken communication between tech and non-tech audiences, including classroom and online teaching, and invited speaking.